Using the Australia Telescope Compact Array (ATCA), ATLAS (Australia Telescope Large Area Survey) is imaging two fields totalling 7 square degrees down to 10 μJy beam − 1 at 1.4 GHz. We have found 6 wide-angle tail galaxies (WATs), 4 of which have sufficient data to identify associated galaxy overdensities. The largest WAT, at a red-shift of 0.22, appears to be associated with an overdensity of galaxies that is spread over an unusually large extent of 12 Mpc, with a velocity range of 4500 km s − 1. 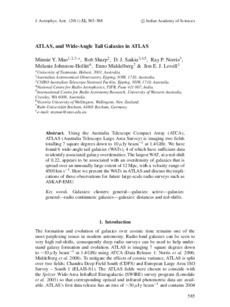 Here we present the WATs in ATLAS and discuss the implications of these observations for future large-scale radio surveys such as ASKAP-EMU.